Shown here is a waste bowl printed with the same pattern. The rim of the bowl has been enameled in brown over the glaze. An earthenware saucer printed in blue with the Tea Party pattern. 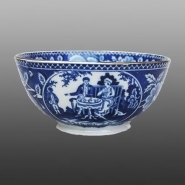 The popular 18th century Tea Party design reappears on both printed and printed and painted underglaze earthenware in the first quarter of the 19th century. While the couple’s apparel has changed to reflect the style of the period and, perhaps, their different social class, the African or Indian servant and the faithful dog are still present in these scenes. It wasn’t until July 1833, that a Bill was passed to abolish slavery throughout the British Empire. So the presence, here, of the African servant on this example, would not necessarily be considered out of place. Sewel & Donkin, as well as Shorthouse, Thomas Fell, Scott (Southwick Pottery), and William Smith also produced versions of this pattern. Examples of the Sewel & Donkin version are also included in this exhibit.